Thai basil (Thai: โหระพา, RTGS: horapha, ISO: h̄oraphā, pronounced [hǒː.rá(ʔ).pʰāː]; Vietnamese: húng quế) is a type of basil native to Southeast Asia that has been cultivated to provide distinctive traits. Widely used throughout Southeast Asia, its flavor, described as anise- and licorice-like and slightly spicy, is more stable under high or extended cooking temperatures than that of sweet basil. 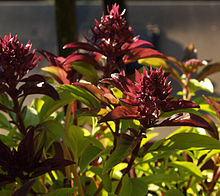 Thai basil has small, narrow leaves, purple stems, and pink-purple flowers. Occasionally, Thai basil may be called cinnamon basil, which is its literal name in Vietnamese, but cinnamon basil typically refers to a separate cultivar. The genus name Ocimum is derived from the Greek word meaning "to smell", which is appropriate for most members of the plant family Lamiaceae, also known as the mint family. With over 40 cultivars of basil, this abundance of flavors, aromas, and colors leads to confusion when identifying specific cultivars. Three types of basil are commonly used in Thai cuisine. 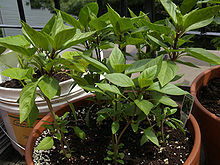 Thai basil, or horapha (Thai: โหระพา), is widely used throughout Southeast Asia and plays a prominent role in Vietnamese cuisine. It is the cultivar most often used for Asian cooking in Western kitchens. Holy basil (O. tenuiflorum), or kaphrao (Thai: กะเพรา), which has a spicy, peppery, clove-like taste, may be the basil Thai people love most.:93. It is also known as Thai holy basil or by its Indian name, tulasi or tulsi; it is widely used in India for culinary, medicinal, and religious purposes. Lemon basil (O. × citriodorum), or maenglak (Thai: แมงลัก), as its name implies, has undertones of lemon in scent and taste. Lemon basil is the least commonly used type of basil in Thailand. :94 It is also known as Thai lemon basil, in contradistinction to Mrs. Burns lemon basil, another cultivar. Thai basil is sturdy and compact, growing up to 45 cm (1.48 ft), and has shiny green, slightly serrated, narrow leaves with a sweet, anise-like scent and hints of licorice, along with a slight spiciness lacking in sweet basil. Thai basil has a purple stem, and like other plants in the mint family, the stem is square. Its leaves are opposite and decussate. As implied by its scientific name, Thai basil flowers in the form of a thyrse. The inflorescence is purple, and the flowers when open are pink. Thai basil is a tender perennial but is typically grown as an annual. As a tropical plant, Thai basil is hardy only in very warm climates where there is no chance of frost. It is generally hardy to USDA plant hardiness zone 10. Thai basil, which can be grown from seed or cuttings, requires fertile, well-draining soil with a pH ranging from 6.5 to 7.5 and 6 to 8 hours of full sunlight per day. The flowers should be pinched to prevent the leaves from becoming bitter. Thai basil can be repeatedly harvested by taking a few leaves at a time and should be harvested periodically to encourage regrowth. Thai basil is widely used in the cuisines of Southeast Asia, including Thai, Vietnamese, Lao, and Cambodian cuisines. Thai basil leaves are a frequent ingredient in Thai green and red curries, though in Thailand the basil used in drunken noodles and many chicken, pork, and seafood dishes is holy basil. :178 In the West, however, such dishes typically contain Thai basil instead, which is much more readily available than holy basil. Thai basil is also an important ingredient in the very popular Taiwanese dish sanbeiji (three-cup chicken). Used as a condiment, a plate of raw Thai basil leaves is often served as an accompaniment to many Vietnamese dishes, such as phở, bún bò Huế, or bánh xèo, so that each person can season to taste with the anise-flavored leaves. Wikimedia Commons has media related to Ocimum basilicum thyrsiflorum. ^ a b Simon, James E.; Morales, Mario R.; Phippen, Winthrop B.; Vieira, Roberto Fontes; Hao, Zhigang (1999). Janick, Jules (ed.). "Basil: A Source of Aroma Compounds and a Popular Culinary and Ornamental Herb". Perspectives on New Crops and New Uses. Alexandria, VA: ASHS Press: 499–505. ^ a b c d Loha-Unchit, Kasma (1995). "Garden Herbs". It Rains Fishes: Legends, Traditions and the Joys of Thai Cooking. Pomegranate Artbooks. ISBN 0876543565. OCLC 31865230. ^ Hill, Madalene; Barclay, Gwen; Hardy, Jean (1987). Southern Herb Growing. Shearer Publishing. p. 68. ^ "Classification for Kingdom Plantae Down to Species Ocimum basilicum L." Natural Resources Conservation Service. United States Department of Agriculture. Retrieved 11 April 2011. ^ Loha-unchit, Kasma (1995). "Holy Basil – Bai Gkaprow". Thai Food & Travel. Retrieved 11 April 2011. ^ Cox, Jeff; Moine, Marie-Pierre (2010). The Cook's Herb Garden. London: DK Publishing. p. 53. ^ Hutchinson, Frances (2003). "Garden Herbs". The Gardener's Handbook. Fog City Press. p. 237. ^ Raghavan, Susheela (2007). Handbook of Spices, Seasonings, and Flavorings (2nd ed.). Boca Raton, Florida: CRC Press. p. 72. ISBN 9780849328428. Retrieved 8 December 2014. ^ "LAMIACEAE (formerly LABIATAE) - The Mint Family". The Seed Site. Retrieved 11 April 2011. ^ a b Meyers, Michele (2003). Basil: An Herb Society of America Guide (PDF). The Herb Society of America. p. 32. Archived from the original (PDF) on 19 March 2015. Retrieved 8 December 2014. ^ Brissenden, Rosemary (2003). Southeast Asian Food: Classic and Modern Dishes from Indonesia, Malaysia, Singapore, Thailand, Laos, Cambodia and Vietnam. Singapore: Periplus Editions. p. 34. ISBN 9780794604882. Retrieved 8 December 2014. ^ a b "Basil, Thai Basil, Organic". Seedaholic.com. Retrieved 8 December 2014. ^ Andrews, A.J. "How to Plant Thai Basil". SFGate Home Guides. Retrieved 8 December 2014. This page was last edited on 18 June 2018, at 00:33 (UTC).